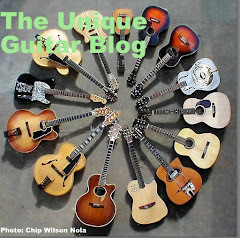 Through the years, the Fender Musical Instrument Company has made some very fine instruments. Leo Fender came up with the original electric bass guitar. However Fender has offered quite a few unique and somewhat unknown instruments. Here are a few of Fender's bass guitars for all you bass players and those interested in guitar history. 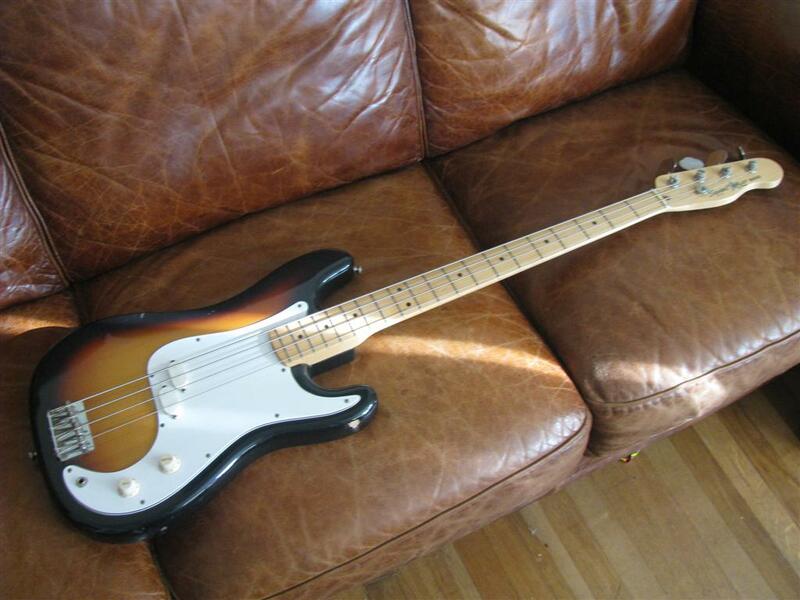 It was around 1965 that Fender came up with a concept of shrinking the bass guitar. 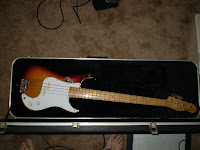 Fender came up with the concept of a bass neck with fewer frets, that allowed the player to have access to all the notes on the traditional electric bass guitar without having to play on the top end of the fret board. Theoretically this would eliminate the ‘woofy’ sounds one gets when the string is shortened at the top of the fretboard. Fender did this by adding another high string which was tuned to C.
The neck had only 15 frets but had the same tonal range as a 20 fret bass. It was hoped that bass players who actually read music would adapt to this bass. Unfortunately, this concept failed to produce results. Bass players were happy with their Precision Basses and Jazz Basses. The smaller size of the Fender V did not win favor with the bass crowd nor did the condensed spacing between the strings. Fender made around 1000 of these instruments between 1965 and 1970. Ironically Fender was headed on the right track, but should have made the instrument with a low B, instead of the high string. It was in the 1950’s when Nathan Daniels of Danelectro was building his unique electric guitars and 4 string electric basses, most of which he sold under different labels through businesses such as Sears and Montgomery Wards. In 1956 he had he came up with the concept of adding two additional strings and tuning the instrument an octave down from a regular guitar. This became an instant success for Daniels. Many major pop and rock recordings through the mid 1950’s to the mid 1970’s featured a bass player and a six string bass player. Sometimes the six string part was called ‘tic tac’ bass. The sound was lower than a guitar and brighter than the bass line. But it wasn’t until 1961 that Fender took note of this and created their own version of the six string bass. 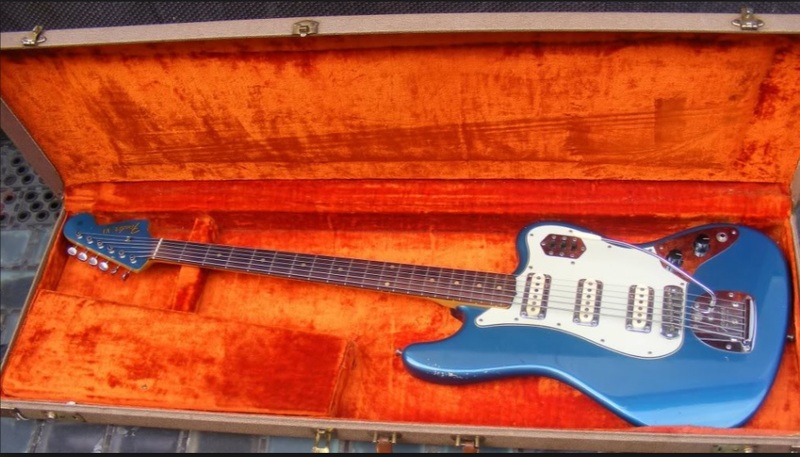 The body was similar to the Fender Jazzmaster, which was already in production, but the top horn was shaped more like a Stratocaster. The control layout was very similar to the Fender Jaguar, which was introduced the following year. Fender named this the Fender VI. 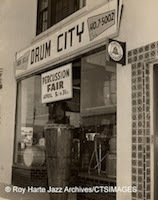 The scale was 30” and shorter than the 34” scale of Precision and Jazz basses. The strings were much thinner than those on standard Fender basses. 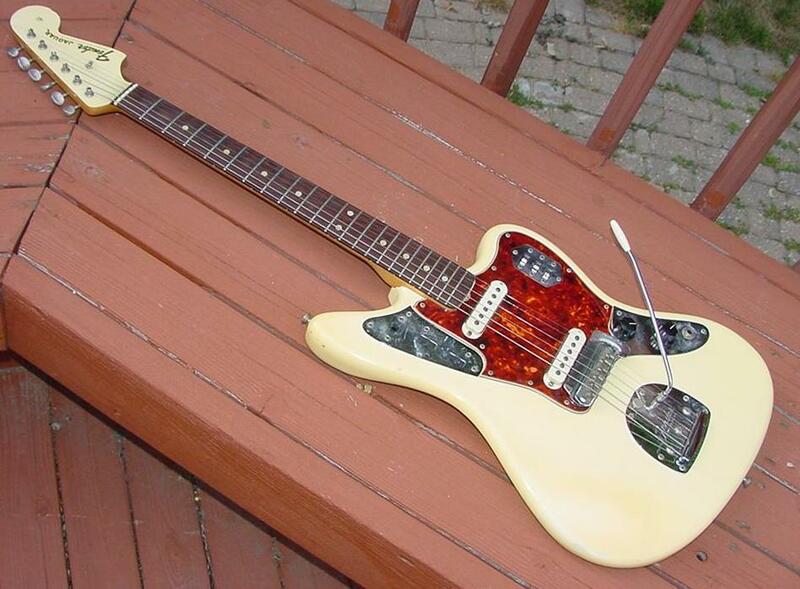 The instrument came with 3 single coil Fender pickups and a vibrato unit similar to the one on the Jazzmaster. Originally the controls included a single volume and tone potentiometer and three slider on-off switches on the upper bout that controlled which pickup was working. Later models added a fourth slider which was a bass cut switch. This added a brighter treble sound to achieve the tic-tac effect. Due to the shortened neck and the 7.25” neck radius, which was standard on Fender guitars of the day, setting the guitar up and achieving tonality was difficult. Besides bass players are used to fairly wide necks with space between the strings. The standard string guage that Fender suggested was .025 to .095. Some guitarists compensated by making this a “baritone guitar” by using heavy guitar strings and tuning from low B to high B. In 2013 Fender put the Bass VI back into production under the Squier brand. The Squier version of the six string bass has a 28” scale and a humbucker bridge pickup along with two single coil pickups. World War II put Britain in a lot of debt to the United States. To offset this war debt, the UK levied high tariffs on items imported from the United States. This put a big damper on the guitar market, which is why many ‘60’s British bands played a lot of guitars that were built in Europe. For instance Paul McCartney played a German Hofner bass and Bill Wyman played a Framus bass that was also made in Germany. Sometime around the early 1960’s a music store in London, Drum City aka Dallas-Arbiter, ordered some specially made Fender Precision bass guitars. These instruments had the same body shape we are all familiar with, but had one difference; there was no body contour. These became known as Slab Precision basses. The most widely known user of this extremely rare and seldom seen instrument was John Entwhistle of The Who. Around 1966 acquired about 20 of these bass guitars and smashed 3 of them to bits. Entwhistle swore these slab p-basses had a much better tone than the contoured ones and believed the electronic circuitry was different. In 1982, under the direction of John Page, Fender put together a line of budget priced guitars and basses under the Bullet label. 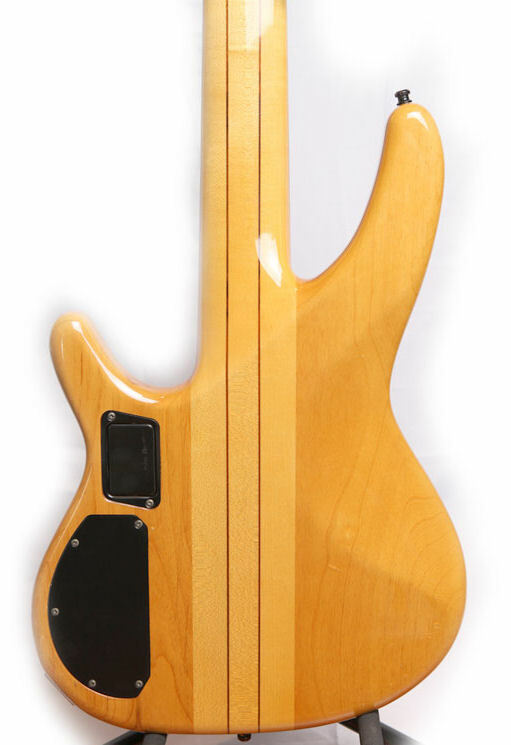 The Fender Bullet Bass was produced from 1982 to 1986. It was a replacement instrument for the Fender Mustang Bass and the Music Master Bass, both of which were discontinued in 1981. 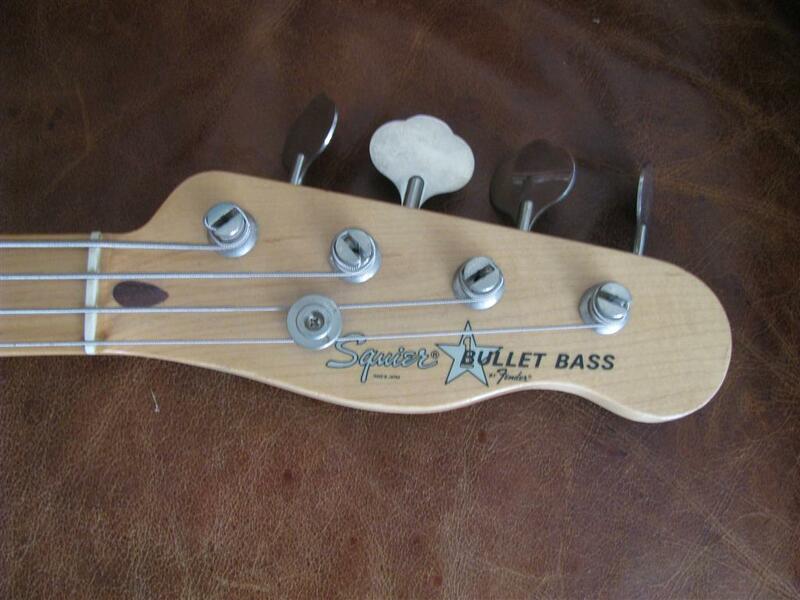 The Bullet Bass came in two versions. One was a short scaled model, called the B-30 (30” scale) and the long scaled B-34 (34” scale). Both had a body shape much like the Precision bass, however the headstock had a Telecaster shape. They both came with one single coil pickup that was not split. The original ones had the Fender logo with a star graphic that stated Bullet Bass Deluxe. These basses were made in the USA from 1982 to 1984. Fender moved production to Japan and produced both basses there until 1986 when production stopped. Production started up again in 1987 when the B-34 was rebranded the Squier Bullet Bass. It discontinued in 1988. In 1985 Fender took note of the pointy guitar craze and came up with the Katana Guitar and Katana Bass, both made in Japan. These were perhaps Fender’s oddest instruments ever. The body was sort of an asymmetrical triangle with a pointy headstock. The bass came with one pickup. This was Fender’s first bass guitar made with an unusual 32” scale. The bass and guitar lasted less than a year when Fender pulled the plug in 1986. Fender seemed determined to enter the pointy guitar/bass market. The mid 1980’s were the years of Heavy Metal Hair bands and some lackluster years for Fender. In 1986 Fender struck out again with two versions of a model known as the Performer Bass. Both models came with pointy headstocks and distinctive shaped bodies. What made the models most unique was the two octave neck range. 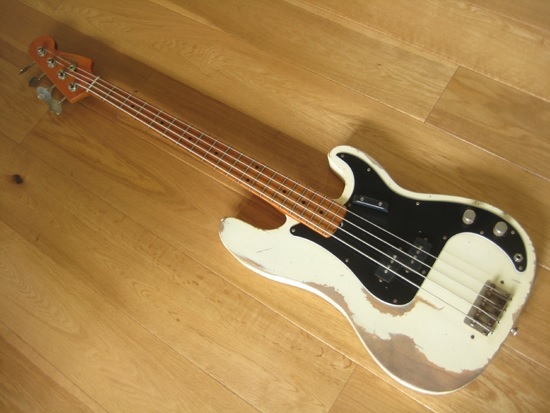 One model was made at the Fender Japan facility and known as the Standard Performer Bass. This guitar came with a white pickguard and twin pickups that had a most unique shape. The neck was rosewood and this bass sold for around $500 USD. The Elite Performer Bass was an upgrade and subsequently more expensive; $950 USD. It was US made and came with three uniquely shaped pickups and no pickguard. It is rumored a five string version was made as a prototype. Both of the Performance Basses as well as the Katana are very rare, and though under appreciated when created, now command high prices by collectors. 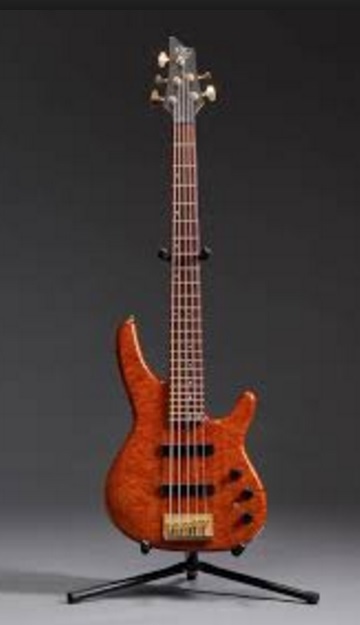 Philip Kubicki was a luthier that became well known in the 1980’s for his Factor Bass. This was a bass that had locking tuners on the body much like the Steinberg bass. Kubicki worked for Fender from 1964 to 1973 as a student of Roger Rossmeisel. Kubicki could not keep up with orders for his Factor Bass, so he worked out a licensing agreement with Fender in 1990 to produce the Fender/Kubicki Factor 4 and Ex-Factor 4 Extended Bass. Both came in fretted and fretless models. Unfortunately sales began to slack off and Fender quit offering the instruments by 1992. Stu Hamm is a well known session bass player. In 1993 Fender was hoping that a very classy looking bass would peek the interest of professional bass players looking for a classic well made instrument. This was the era of natural wood basses. So Fender tapped Stu Hamm and made some very high end instruments and used his name. It is said that he was the first musician to receive a signature Fender bass model. The original Stu Hamm Urge bass was first offered in 1993. It was made in the USA and built to Hamm’s specifications. The body had an original shape, the oval neck profile was custom designed and had a two octave range and a 32” scale. It came with 3 pickups. Jazz bass pickups in the bridge and just above the center position and a Precision bass pickup in the center of the body. The electronics were both passive and active. There was a master volume/pan knob, a bass/treble know, a four position EQ knob and a three position pickup selector. The output jack was stereo. The through the body bridge was gold plated as were the tuning keys and other hardware. It sold for around $1600 USD. In 1994 Fender also offered a Mexico built version with a poplar body, rosewood fingerboard, twin Jazz bass pickups, a dual concentric knobs. One was for volume/pan and the other was a bass/treble boost/cut. The electronics were passive. This was outfitted with a black pickguard, vintage style Fender Bridge and tuners. All hardware was chrome. It sold for around $600 USD. Both instruments were produced between 1993 and 1999. In 1999 Fender replaced the former bass guitars with the upscale Stu Hamm Urge II Bass. This beautiful instrument was made of selected alder. The neck was full scale; 34”. Like the original Stu Hamm Bass, the pickup configuration was twin Jazz bass pickups on the bridge side, a Precision bass pickup in the center and another Jazz bass pickup above it. The bass featured four control knobs, including a master volume/pan control, a three-band active EQ knob with treble, bass and mid cut/boost. It also had a 3 position toggle pickup selector. The neck on this guitar was had Posiflex graphite support rods. The tuners were Fender/Schaller deluxe models. 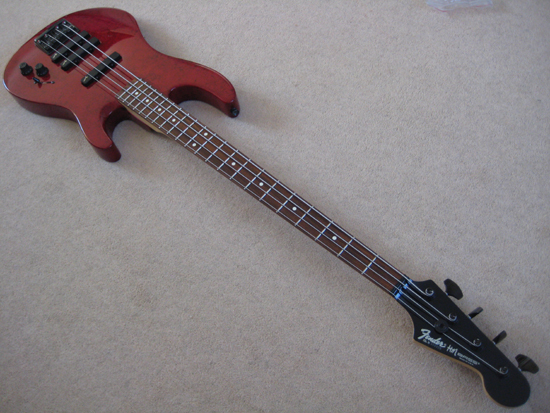 The bass was offered in a number of finishes. The colored bass guitars had matching head stocks while the sunburst model came with a natural finished headstock. This instrument sold for $2285 USD. In 2007 this same model was upgraded to include a Hipshot drop-D tuner on the E string. New finish options were available. The price was now $2740 USD. It was dropped from the Fender line-up in 2010. During the mid 1980’s Charvel, Jackson and Ibanez guitars reigned supreme with their Super Strat guitars. Fender tried to enter the market with it’s Katana and Performer line but were unsuccessful. By 1989 Fender came out with the Heartfield DR bass guitars. This lineup consisted of six different models. The first offered were the DR4 and DR5; four and five string basses. The bodies were alder, the bolt on necks were tri-laminated for strength in an unusual manner. They were made up of maple/graphite/rosewood. The headstock featured tuners on both sides of the neck. The basses electronics were active. The pickups were low Z output and hum cancelling. These basses were made at the Fender Japan facility. Later that year, Fender offered custom ordered neck-through versions with elaborate laminated tops and gold hardware. This was called the DR4C and the DR5C. These bass guitars had 22 fret necks with a 19.7” fingerboard radius. The DR4 had a 12” radius. Fender also offered another custom ordered model called the DR6C which had six strings. By 1993 Fender discontinued the series. The Heartfield was expensive to produce especially with the diminishing value of the yen. 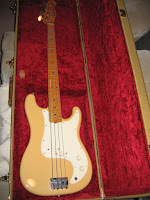 During the same time frame beginning in 1989 Fender offered a budget version of the Heartfield bass called the H.M bass. These came in Fender and Squier versions and sold for approximately $300 USD. They were made for the heavy-metal pointy headstock crowd ala the “H.M.” logo. The Fender version came with three Jazz bass pickups and a TBX (treble and bass cut), a 9.5” radius and multiple customer colors. The Squier version included two pickups and no switching. The neck radius on the Squier was 12”. Fender made a bold move in 1991 by offering the H.M. Bass Ultra. It had a figured maple top and back, a tri-laminated neck with maple/graphite/rosewood, three Fender Lace Sensor J-Bass pickups, five way switching and active electronics. The tuners were made by Gotoh. This beast came with a price of $1350 USD. The entire H.M series was shut down in 1993 due to poor sales and manufacturing costs. Up until 1966, Fender had only offered two different bass guitars; The Precision Bass and the Jazz Bass. In 1966 Fender offered a brand new guitar called the Mustang. It was an upscale version of the Musicmaster and Duosonic. The Mustang Guitar was a short scale instrument with a 22” scale. 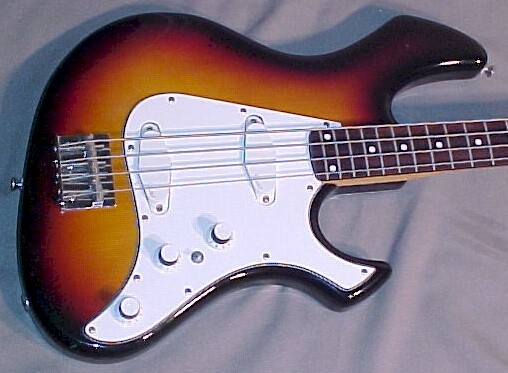 As a companion Fender came up with the Mustang Bass. 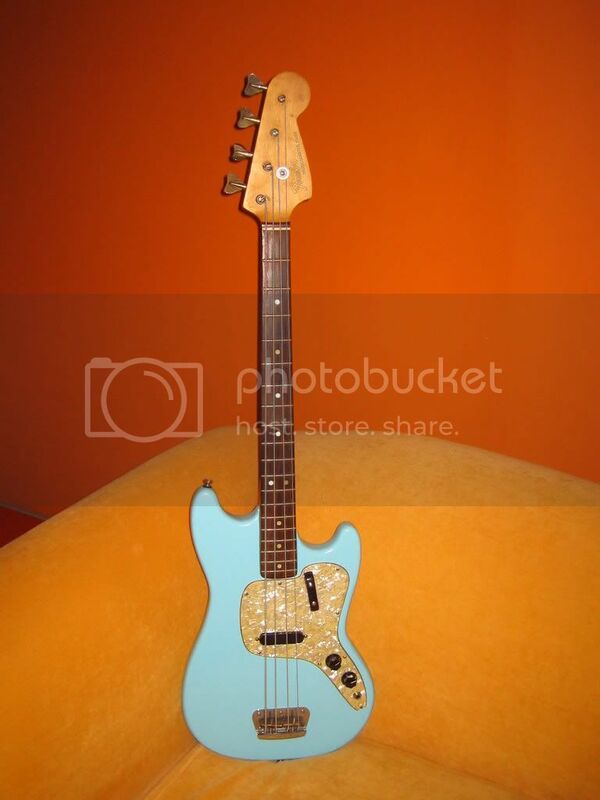 Interestingly, this was the final bass guitar Leo Fender designed for his company. 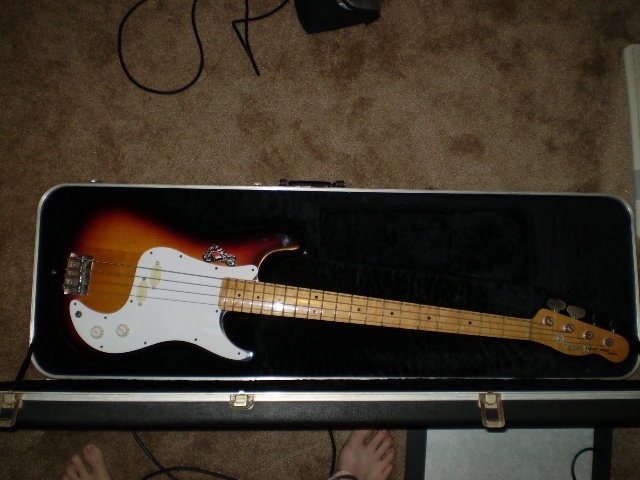 The Mustang Bass had a short scale; 30” and one split Precision style bass pickup. The guitar had a volume and tone control and a thumb rest. 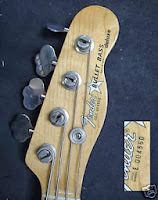 The headstock was, similar to other Fender basses. The Mustang came with four standard bass tuners. The standard finish was red or white. The pickguards were generally tortoise shell style. Three years later, in 1969, Fender introduced the Competition Mustang by adding a diagonal racing stripe on the instruments body along with some new finishes. 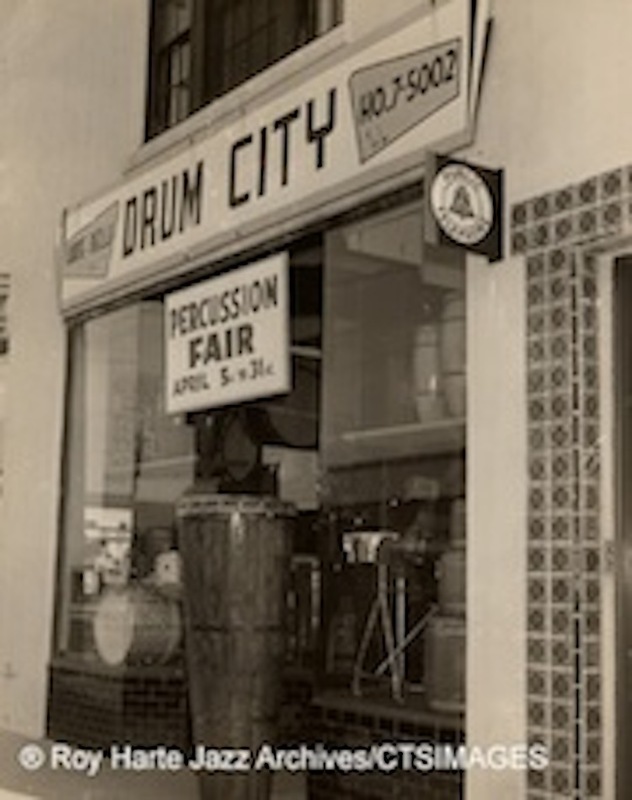 It continued in production through 1981. In 2002 production briefly resumed in Japan. 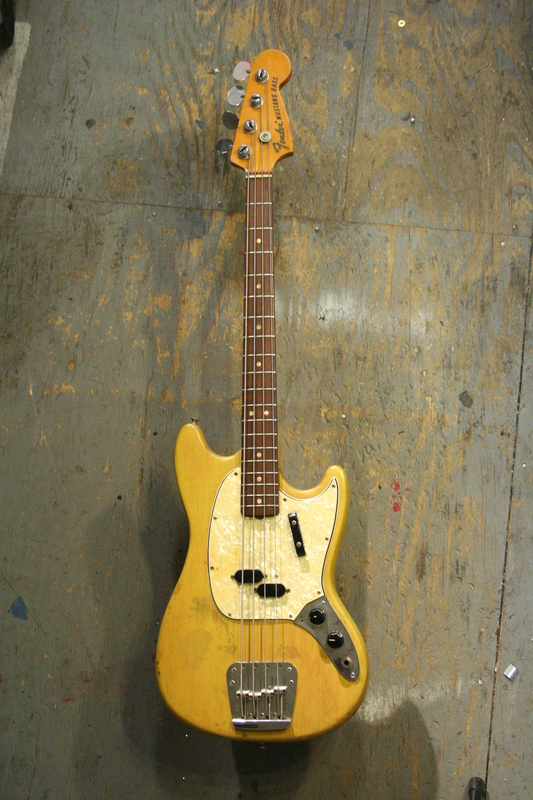 The Musicmaster Bass was a similar guitar and also issued in the mid 1960’s. This was aimed at the student model market. 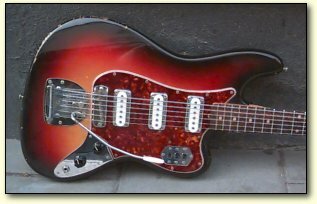 The body shape was similar to the Mustang, however the pickguard was white. 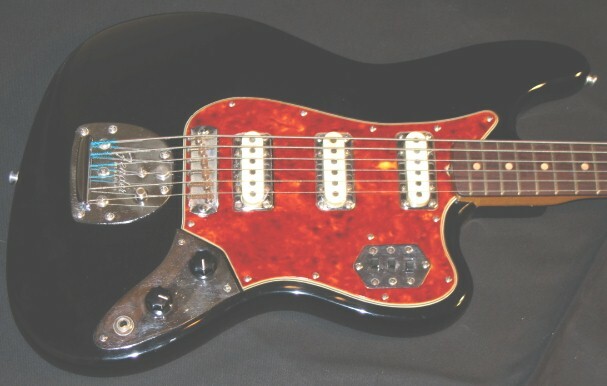 The Mustang had a chrome section for the controls, but the Musicmaster’s controls were housed on the plastic pickguard. This bass had one Stratocaster pickup on the center of the body. The scale was 30”s. This guitar was pulled from the lineup around 1981. 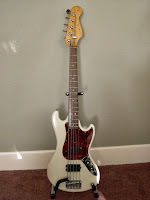 The Squier Musicmaster bass resurfaced briefly in 1997 for one year and then was rechristened the Bronco Bass. Squier began offering the Mustang bass in 2011 as a part of the companies Vintage Modified series. It is now the Modified Mustang bass. This year, 2013, Fender introduced the Mustang bass as a part of its Pawn Shop Series. These guitars are made at the Fender factory in Mexico. A very young James Burton.